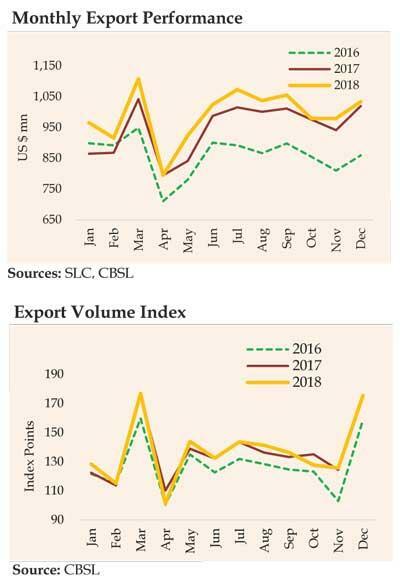 Sri Lanka’s trade deficit expanded over US $ 10 billion in the year 2018 despite a significant decline in the December trade deficit with a notable deceleration in the import expenditure, the data released by the Central Bank showed. The December imports fell sharply by 15.3 percent year-on-year (YoY) to US $ 1,735 million while the exports edged up by 1.4 percent YoY to US $ 1,033 million, resulting in a trade balance of US $ 701 million, compared to a trade balance of US $ 1,029 million in December 2017. However, the trade deficit on a cumulative basis for the full year widened to little over US $ 10.3 billion, compared to a trade balance of US $ 9.6 billion in 2017, as import growth outperformed the growth in exports. The exports during 2018 grew 4. 7 percent YoY to US $ 11.89 billion while the imports grew 6 percent YoY to US $ 22.23 billion. The Central Bank said the imports in December decelerated due to the measures implemented to discourage vehicle and non-essential consumer goods imports. Personal vehicle imports during December fell 18.9 percent YoY to US $ 77.3 million. However, the cumulative vehicle imports during 2018 more than doubled to US $ 1,573.5 million, from US $ 772.7 million in 2017. The consumer goods imports in December fell 17.7 percent YoY to US $ 357 million, largely due to the lower rice imports while the cumulative figure rose 10.6 percent YoY to US $ 4, 979.7 million. The intermediate goods imports in December fell 17.6 percent YoY to US $ 983.1 million, as the oil bill declined 26.8 percent YoY to US $ 317.3 million, due to the lower import prices and volumes. However, the cumulative oil bill for 2018 rose 38.9 percent YoY to US $ 978.1 million. Interestingly, zero gold imports during December were recorded while the cumulative gold imports fell 32.5 percent YoY to US $ 438.7 million, due to the higher customs duty introduced on such imports. The expenditure on the importation of investment goods also declined in December, mainly due to the lower imports of machinery and equipment and transport equipment, while the imports of building material increased. Meanwhile, the Central Bank said the marginal growth in exports in December was due to the base effect as December 2017 recorded the highest export value in 2017. Textile and garment exports, which rose 5 percent YoY to US $ 493.4 million, accounted for almost half of the total exports during December. The cumulative textile and garment exports in 2018 rose 5.7 percent YoY to US $ 5,317.7 million. The rubber product exports, mainly consisting of tyres, rose 2.4 percent YoY to US $ 76.4 million in December while the cumulative value rose 4.8 percent YoY to US $ 875.3 million. The export income from petroleum products, largely stemming from bunkering operations, fell 15.2 percent YoY to US $ 52.9 million in December. However, the cumulative figure rose 43.2 percent YoY to US $ 622.1 million. The agriculture exports in December fell 1.4 percent YoY to US $ 216.6 million while for the full year it fell 6.8 percent YoY to US $ 2, 579.3 million. Tea exports during December fell 7.8 percent YoY to US $ 117.1 million while the cumulative figure fell 6.6 percent YoY to US $ 1,428.5 million. The exports of spices fell 8.2 percent YoY to US $ 30 million in December while such exports in 2018 fell 11.3 percent YoY to US $ 360.2 million. Despite the removal of the ban by the European Union, seafood exports rose only 10.5 percent during 2018 to US $ 265.8 million. The December exports rose 35.7 percent YoY to US $ 29.2 million. Meanwhile, the earnings from tourism remained healthy with a 4.8 percent YoY growth in December resulting in a total income of US $ 4.4 billion in 2018, a growth of 11.6 percent from 2017. Workers’ remittances recorded a marginal decline of 2.1 percent YoY in 2018 to US $ 7.0 billion, including a 13 percent decline in December. In the financial account, the government securities market and the Colombo Stock Exchange recorded outflows in December.